Setapp has something for everyone, and that includes professional software developers who need the most powerful tools available. Paw, new to the Setapp family, is a one-stop shop, a robust, Mac-native HTTP client that lets developers build software with APIs. Now, this is pro software for pro developers: If you don't know acronyms like API, PHP, REST, SSL, and JSON, for example, this probably isn't for you. But let's briefly explain why Paw so helpful. API stands for application programming interface, and they are basically the building blocks for connected apps. Developers can use an API to request data from another program or service, and the API also defines what kind of data will come back. Think of it like the cable that connects your TV to your Xbox. The Xbox knows how to send out signals, and the TV knows how to convert those signals to the image it's going to display, but you need a compatible cable, or the API, to get that data from one place to another. Developers might use dozens or even hundreds of APIs in a project, and Paw helps manage the entire process. You can import repositories of APIs, and set up different environments for different projects or for working with different servers or accounts. Paw has robust tools for describing your APIs, including their variables and restraints, so when you're browsing through them later you'll quickly get an idea of what it does. Paw's clean interface lists your environments in a pane on the left, lets you build your API requests in the center pane, while the relevant code is generated below, ready to copy and paste into your coding project. In the pane on right, you can see what kind of data your request is sending off to the server, and inspect the response it sends back. But the coolest thing about Paw is its use of Dynamic Values. 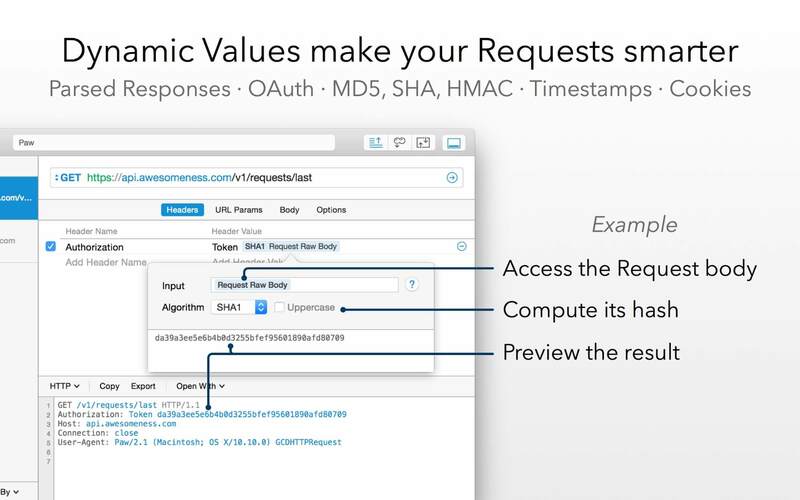 Dynamic simply means something that changes, so in this case Paw lets you use data from one API response to build another API request—for example, an auth token—and the data gets updated in real time. Paw also supports all the standard authentication schema, as well as letting you configure your own with dynamic values. 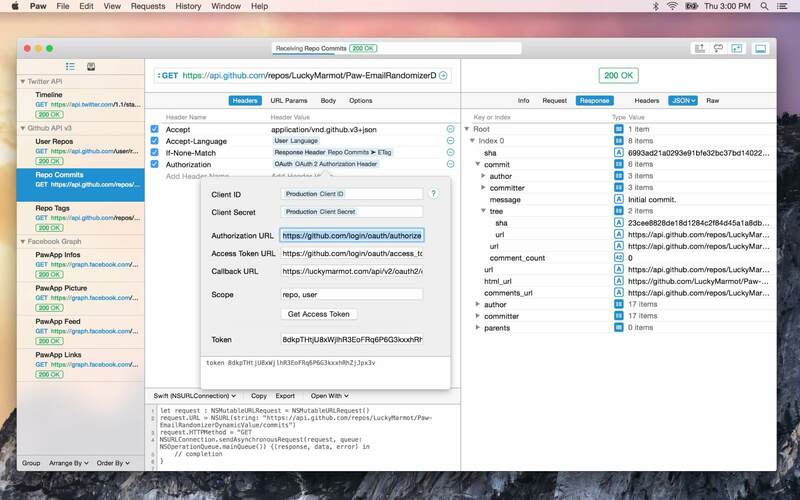 If you are a professional software developer looking for the most powerful tools around, look no further than Paw — a one-stop robust Mac-native HTTP client for testing and describing APIs. Use dozens or even hundreds of APIs in a project without pain, while Paw helps you manage the entire process. You can import repositories of APIs and set up separate environments for different projects or for working with different servers. Plus, Paw has robust tools for describing your APIs, including their variables and restraints, so when you're browsing through them later you'll quickly get an idea of what they do. Here’s how you can include APIs in your work today. When you are ready to work with Paw, first list all your environments on the left pane. Your active working area for building out API requests would be in the center, and on the right pane, you can see what kind of data requests you are sending off to the server and inspect the response as well. Dynamic values are Paw’s coolest feature. Basically, they let you use data from one API response to build another API request — for example, an auth token — with all data getting updated in real time. Paw also supports the standard authentication schema and even allows you to use dynamic values to configure your own. While some built-in features like text completion, drawing from a database of HTTP headers, make development much faster, you can add a variety of extensions to Paw and let it do much more. Extend language support, generate documentation from Markdown and Curl, and import to Paw from other formats. Write your own extensions too! In fact, developers can add extensions to Paw to let it do even more. Extensions can let Paw export code in languages it doesn't support natively, generate documentation from Markdown and Curl, and import to Paw from other formats. Developers are even free to write their own extensions, giving Paw a lot of flexibility. Web developers who work on the Mac deserve tools made just for them. Paw is native to macOS, so it's fully sandboxed for security. It also takes full advantage of your Mac's computing power, using Apple's Grand Central Dispatch to multithread tasks across your processor's cores, for a faster performance. Its slick text completion feature can speed up your workflow too—it draws from a built-in database of HTTP headers, plus learns from your entries and even suggests dynamic values when they're appropriate. And you can easily sync Paw projects across your machines with Paw Cloud. Web developers who work on Macs deserve tools made just for them. Paw is native to macOS, so it's fully sandboxed for security. It also takes full advantage of your Mac's computing power, using Apple's Grand Central Dispatch to multithreaded tasks across your processor's cores, for a faster performance. And not least, you can sync Paw projects easily across your machines with Paw Cloud. For more, refer to Paw’s excellent online documentation and test it out yourself free on Setapp. Just import a project and get started.